USGS Aerial Photo of Sharon, Barber County, Kansas, 17 Aug 1991. 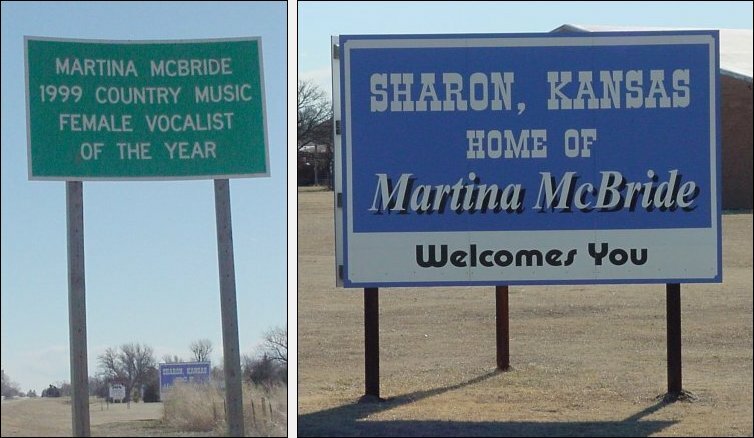 Sharon, Kansas: Hometown of Martina McBride. Two signs along Highway 160, February 2007. Photograph courtesy of Ed Rucker. "This is a photo about 2 miles north of Sharon looking south with the zoom lens on the camera." Photo & comment courtesy Ed Rucker. 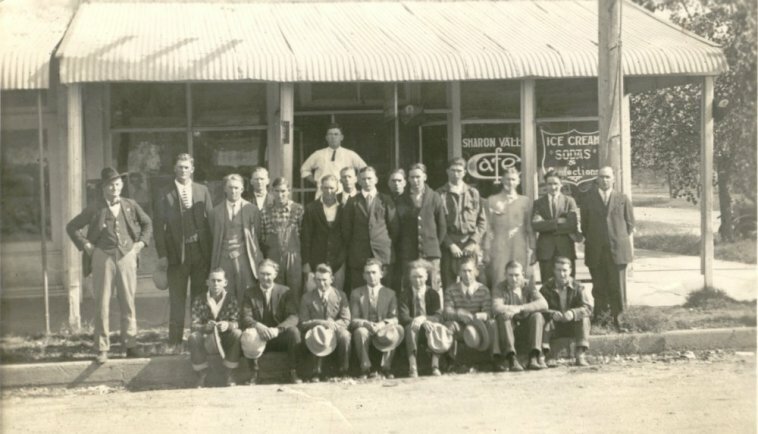 Group of men in front of the Sharon Valley Cafe, Sharon, Kansas, circa 1928. The original photo is captioned: "MWA Sharon Camp No 5436 Oct, Class 28 Camp"
Photo courtesy of Ed Rucker. A.W. 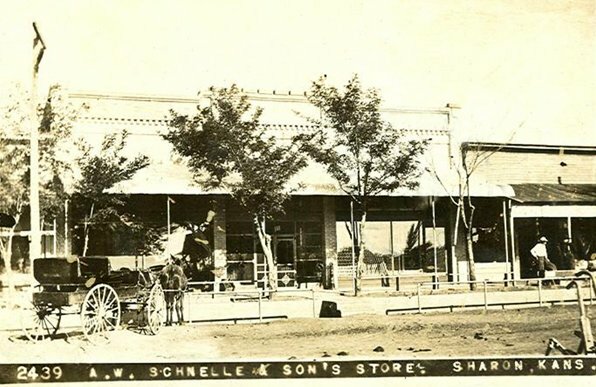 Schnelle & Sons Store, Sharon, Kansas. 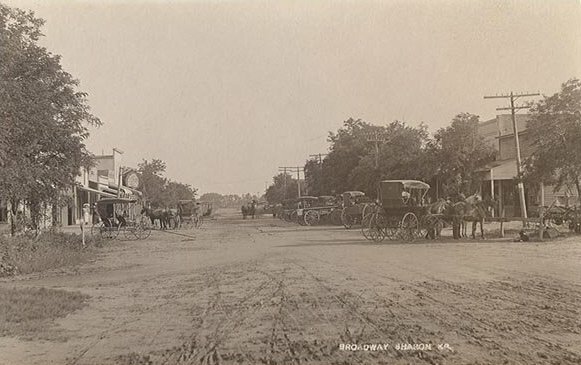 Horses and buggies on Broadway, Sharon, Kansas. 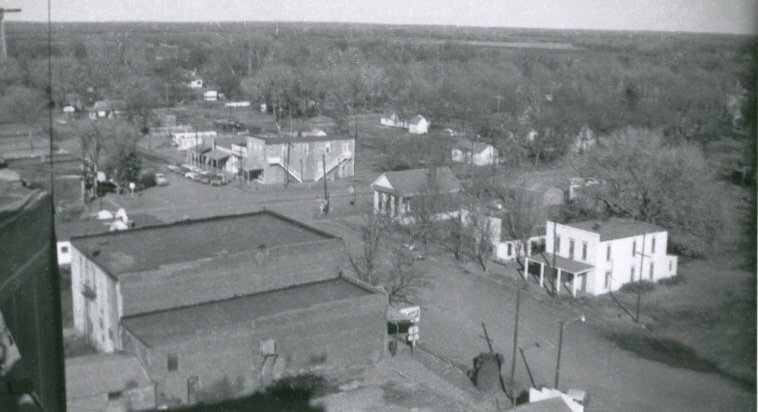 Sharon, Kansas, January 1958, view looking north. "The building in the middle to right with the pillars and the triangular roof is Wisner Library. I believe the street is called Broadway that is being looked down. The "main" street in Sharon is not called Main Street. Photo and comment courtesy of Ed Rucker. "The building in the middle right behind the white building is also partially shown in the first photo. This building is diagonally across the street from Wisner Library. 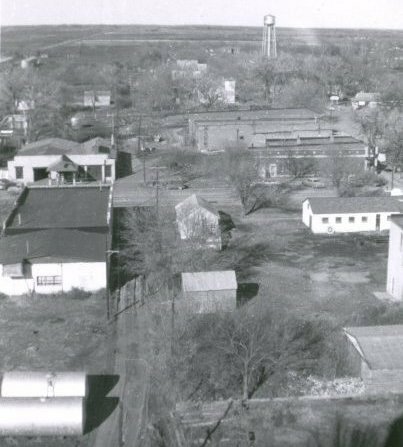 The water tower in the photo is in the city park now named Martina McBride Park. Plot Map of Sharon, Barber County, Kansas. From the Standard Atlas of Barber County Kansas, 1905. 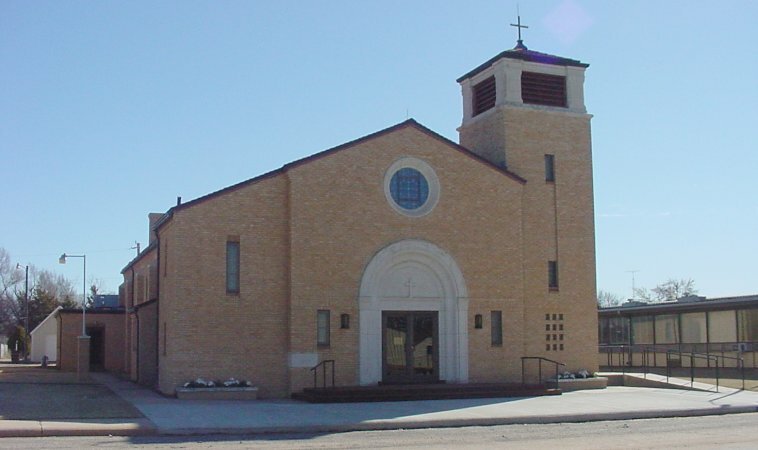 Sharon Christian Church, Sharon, Kansas, 1917-1918. Photo postcard courtesy of Douglas Lyon. 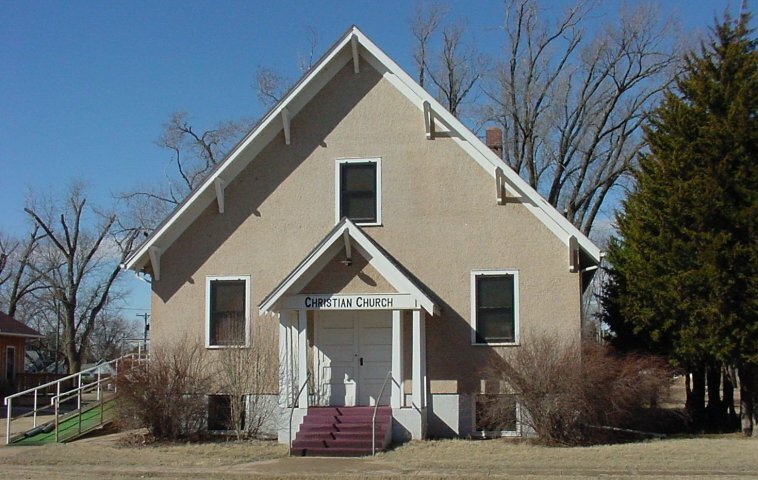 Old Christian Church, Sharon, Barber County, Kansas. February 2007. The Old Baptist Church, now being used as the new Community Church. February 2007. "I have been told that this building is going to be turned into an antique shop." Saint Boniface School, later the Sharon public school. Sharon, Kansas. and there was not a Catholic school. 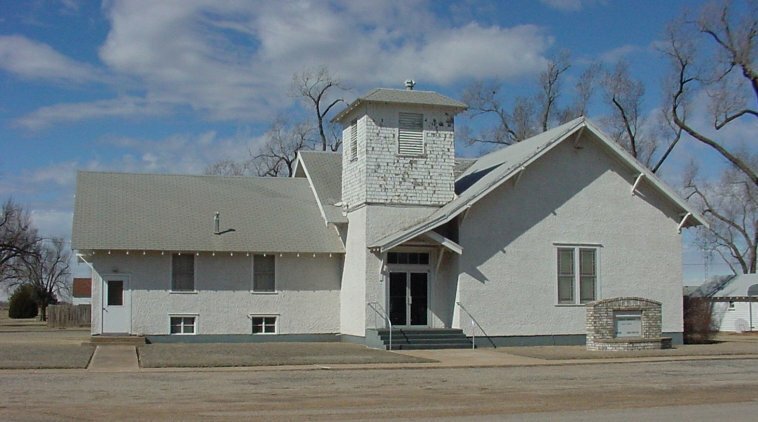 The Parish hall is connected to the school." Photo and comment courtesy of Ed Rucker. 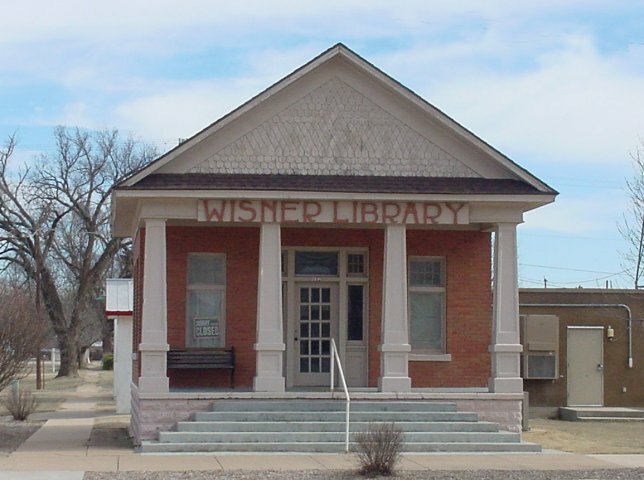 Wisner Library, Sharon, Barber County, Kansas. Sharon Learning Center, formerly Sharon High School, Sharon, Barber County, Kansas. Sharon. A new settlement in the eastern central part of Harper county, 26 miles west of Anthony (ch) and 25 west of Harper, its nearest shipping point. It has a district school, a population of 80, and ships live stock. Land $1.25 per acre. Mail, daily. Mrs. Ollin Cottam, postmaster. Sharon. 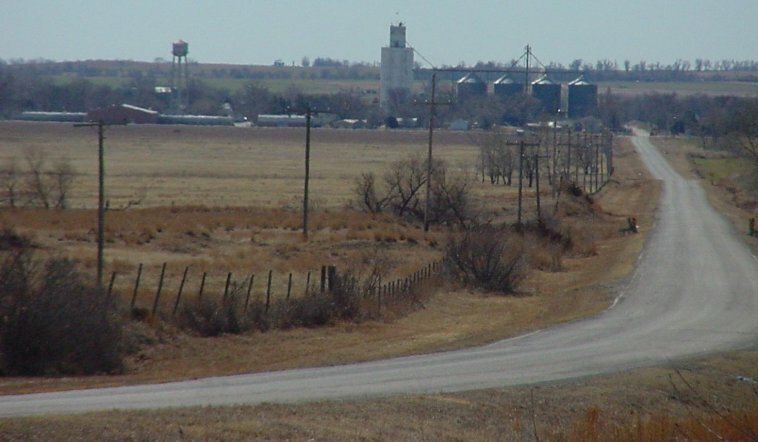 In Barber county, on the AT&SF RR, 11 miles east of Medicine Lodge, the county seat and bank location. It has a church, a district school and a weekly newspaper. Population 250. Exp., W.F & Co. Mail, daily. S.H. Henton, postmaster. Sharon is a smart little town of 200 inhabitants situated on the Medicine Lodge branch of the Santa Fe, eleven miles distant from this city. It has three good stores, excellent hotel accommodations, a church of the Christian denomination, a handsome and capacious school house. It is surrounded by a fertile scope of country, well adapted to agricultural and stock farming, people by an industrious, thriving and prosperous class of citizens. Sharon will grow bigger as business expands and the people prosper. Sharon: city in Barber County, Kansas, town in Schoharie County, New York, and twenty other places. The name is of biblical derivation, from the Hebrew, meaning "a plain". -- The Origin of Certain Place Names in the United States by Henry Gannett, 1905. Oscar Crawford Stabs and Kills Liva Rule at Sharon. Barber County Index, December 31, 1902. The Barber County Index, 17 August 1944. 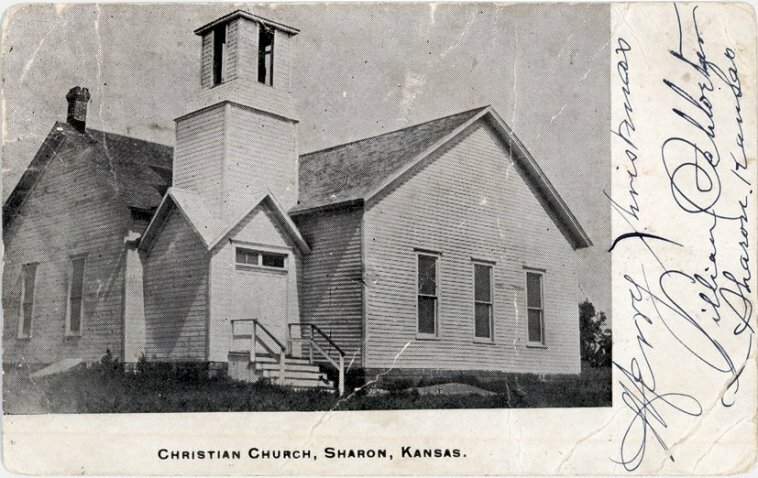 Sharon Christian Church, a photo postcard circa 1917, courtesy of Douglas Lyon. 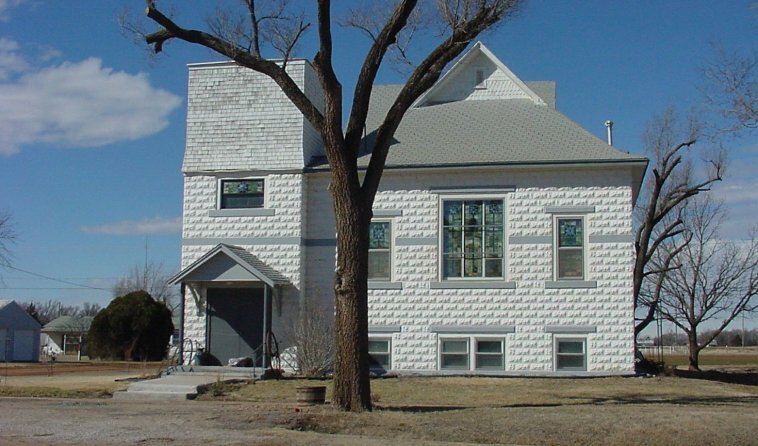 Following are some off-site links about Sharon, Kansas. Sharon Cemetery This listing of burials, which is still in progress in early 2008, is by Ed Rucker. It includes gravestone readings, links to large images of gravestones for each person listed and GPS coordinates for the gravestone of each person listed. This burial list, once complete, will eventually appear on the Barber County, Kansas: History & Genealogy web site. from the Kansas and the West Photograph Collection. Sharon, Kansas, is the hometown of singer Martina McBride! Sharon, Kansas The Blue Skyways page.